Casual Fridays challenge this week is to use punches or dies on a card. My tag is a die using my Cricut. Love that little thing, saves me in a pinch. And the punch is a Fiskars border punch. I know what you are thinking...thought you weren't going to enter any challenges while totally focused on Papercrafts Gallery Idol? What happened???? It is hard to stay away from an addiction. I see all my favorite bloggers entering or designing for them and I want to have some fun too. And despite losing every week, I come back for more. Call me crazy! Speaking of crazy, the dimensions of this card is odd. I was at a paper store back in my hometown of Ohio and bought some interesting envelopes and decided to make a card that fit. I kind of like the change up! This post is dedicated to Virginia Lu and Julie Hoffman. They are always positive and encouraging to me and when I wanted to give up or have a pity party, Thank you! This card is so CAS yet so gorgeous, Wida! Love the bold font and subtle color combo! Thanks for naming me as one of the encouraging bloggers (what an honor)! As a challenge junkie myself, we all need encouragement every now and then. I am glad that you take part in the CAS-ual Fridays and Gallery Idol challenges because you have to give yourself a chance for trying at least, right? That is an ACCOMPLISHMENT in itself already!Congrats! Wish you the BEST of luck! Love, love, love this! Love the over-sized alphas and your use of the bakers twine. This is AWESOME Wida! 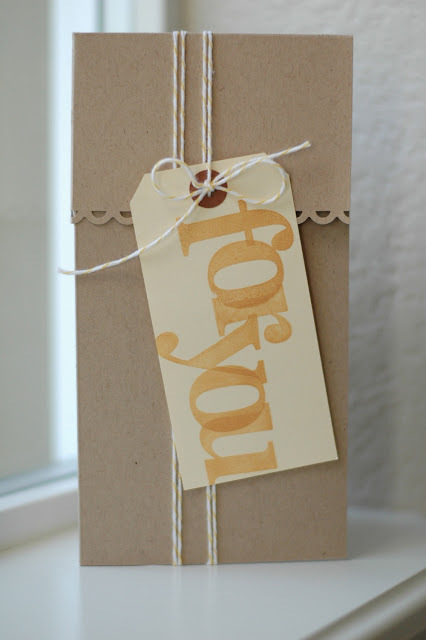 Kraft is one of my go to colors lately and this is so sweet with that cool tag and bakers twine. You're so sweet to name me as being positive and encouraging. You can't win if you don't play and even if you don't win you make some pretty fabulous projects while you're trying!!! This is sooooo sweet! Love the stamped tag! I make cards to fit my envies too! Wida, you are such a fabulous crafter! I look forward to all of your creations. That border punch was one of the first ones I bought! I have dusted it off recently. So glad you did the same! Loving the oversized font again Wida! And I love the odd size too! Sometimes there's too much goodness for just an A2-sized card, lol! Keep the cards coming! Love em! how can you not love everything made from craft paper? Fantabulous! Love that tag with the big letters and the scallop punched edge! Thanks for playing along with us this week at CAS-ual Fridays!